His first major architectural commission was in 1446 for the facade of the Rucellai Palace in Florence. This was followed in 1450 by a commission from Sigismondo Malatesta to transform the Gothic church of San Francesco in Rimini into a memorial chapel, the Tempio Malatestiano. In Florence, he designed the upper parts of the facade for the Dominican church of Santa Maria Novella, famously bridging the nave and lower aisles with two ornately inlaid scrolls, solving a visual problem and setting a precedent to be followed by architects of churches for four hundred years. In 1452, he completed De re aedificatoria, a treatise on architecture, using as its basis the work of Vitruvius and influenced by the archaeological remains of Rome. The work was not published until 1485. It was followed in 1464 by his less influential work, De statua, in which he examines sculpture. 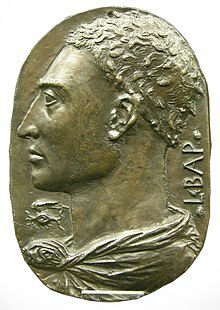 Alberti's only known sculpture is a self-portrait medallion, sometimes attributed to Pisanello. Alberti was employed to design two churches in Mantua, San Sebastiano, which was never completed, and for which Alberti's intention can only be speculated upon, and the Basilica of Sant'Andrea. The design for the latter church was completed in 1471, a year before Alberti's death, but was brought to completion and is his most significant work. Della pittura (also known in Latin as De Pictura) relied in its scientific content on classical optics in determining perspective as a geometric instrument of artistic and architectural representation. Alberti was well-versed in the sciences of his age. His knowledge of optics was connected to the handed-down long-standing tradition of the Kitab al-manazir (The Optics; De aspectibus) of the Arab polymath Alhazen (Ibn al-Haytham, d. c. 1041), which was mediated by Franciscan optical workshops of the 13th-century Perspectivae traditions of scholars such as Roger Bacon, John Peckham and Witelo (similar influences are also traceable in the third commentary of Lorenzo Ghiberti, Commentario terzo). In both Della pittura and De statua, Alberti stressed that "all steps of learning should be sought from nature." The ultimate aim of an artist is to imitate nature. Painters and sculptors strive "through by different skills, at the same goal, namely that as nearly as possible the work they have undertaken shall appear to the observer to be similar to the real objects of nature." However, Alberti did not mean that artists should imitate nature objectively, as it is, but the artist should be especially attentive to beauty, "for in painting beauty is as pleasing as it is necessary." The work of art is, according to Alberti, so constructed that it is impossible to take anything away from it or add anything to it, without impairing the beauty of the whole. Beauty was for Alberti "the harmony of all parts in relation to one another," and subsequently "this concord is realized in a particular number, proportion, and arrangement demanded by harmony." Alberti's thoughts on harmony were not new—they could be traced back to Pythagoras—but he set them in a fresh context, which fit in well with the contemporary aesthetic discourse. The unfinished and altered facade of San Sebastiano has promoted much speculation as to Alberti's intentions. Alberti was an accomplished cryptographer by the standard of his day, and invented the first polyalphabetic cipher, which is now known as the Alberti cipher, and machine-assisted encryption using his Cipher Disk. The polyalphabetic cipher was, at least in principle, for it was not properly used for several hundred years, the most significant advance in cryptography since before Julius Caesar's time. Cryptography historian David Kahn titles him the "Father of Western Cryptography", pointing to three significant advances in the field which can be attributed to Alberti: "the earliest Western exposition of cryptanalysis, the invention of polyalphabetic substitution, and the invention of enciphered code." David Kahn (1967). The codebreakers: the story of secret writing. New York: MacMillan. De Pictura, 1435. On Painting, in English, De Pictura, in Latin, On Painting. Penguin Classics. 1972. ISBN 978-0-14-043331-9. ; Della Pittura, in Italian (1804 ). ^ James Beck, "Leon Battista Alberti and the 'Night Sky' at San Lorenzo", Artibus et Historiae 10, No. 19 (1989:9–35), p. 9. ^ Williams, Kim (August 27, 2010). The Mathematical Works of Leon Battista Alberti. Birkhauser Verlag AG. p. 1. ISBN 978-3-0346-0473-4 – via Duke Libraries. ^ a b c d Melissa Snell, Leon Battsta Alberti, About.com: Medieval History. ^ a b c d Jacob Burckhardt in The Civilization of the Renaissance Italy, 2.1, 1860. ^ Leone Battista Alberti, On Painting, editor John Richard Spencer, 1956, p. 43. ^ Nader El-Bizri, "A Philosophical Perspective on Alhazen’s Optics," Arabic Sciences and Philosophy, vol. 15, issue 2 (2005), pp. 189–218 (Cambridge University Press). ^ a b c d e Liukkonen, Petri. "Leon Battista Alberti". Books and Writers (kirjasto.sci.fi). Finland: Kuusankoski Public Library. Archived from the original on February 10, 2015. ^ Johnson, Eugene J. (1975). "A Portrait of Leon Battista Alberti in the Camera degli Sposi?". Arte Lombarda, Nuova Serie. 42/43 (42/43): 67–69. JSTOR 43104980. ^ De Pictura, book III: Ergo semper quae picturi sumus, ea a natura sumamus, semperque ex his quaeque pulcherrima et dignissima deligamus. Gille, Bertrand (1970). "Alberti, Leone Battista". Dictionary of Scientific Biography. 1. New York: Charles Scribner's Sons. pp. 96–98. ISBN 978-0-684-10114-9. Robert Tavernor, On Alberti and the Art of Building. New Haven and London: Yale University Press, 1998. ISBN 978-0-300-07615-8.